Fraction calculator with steps for operations with two, three, four, five, and six fractions. With fractions calculator you can add fractions with like and unlike denominators, add mixed fractions and whole numbers. 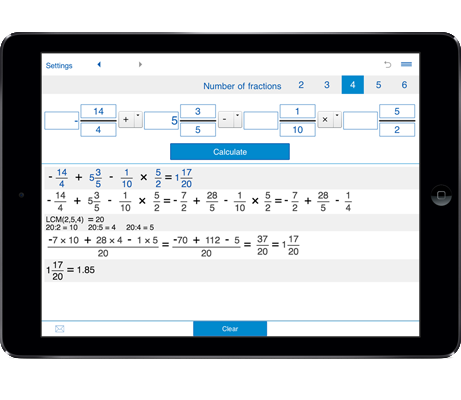 The adding fractions calculator lets you add fractions with different denominators (add fractions with like and unlike denominators), add mixed fractions, add fractions and whole numbers. You can add up to six fractions. 1. Select the number of fractions you need to add - 2 fractions, 3 fractions, 4 fractions, 5 fractions, or 6 fractions. 2. Enter the fractions, mixed fractions or whole numbers you want to add. For adding negative fractions put a minus sign. 3. Click the "Calculate" button.